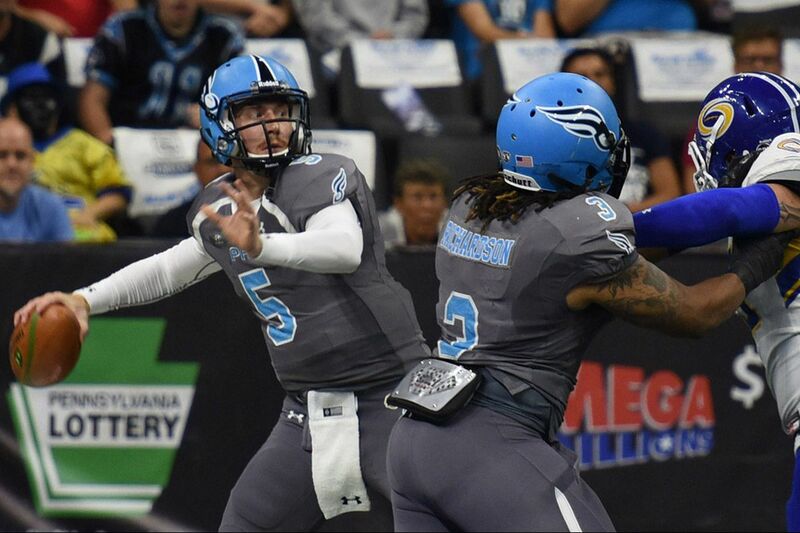 Philadelphia Soul Quarterback Dan Raudabaugh (left) threw one touchdown before resting against the Brigade. The Soul closed out the regular season at 13-1 with a 41-28 win over the Tampa Bay Storm on Saturday at the Wells Fargo Center. Soul quarterback Dan Raudabaugh went 12 for 15 for 145 yards and one touchdown before quarterback Luke Collins came in for relief, going 6 for 11 for 145 yards and two touchdowns. The Soul host the Baltimore Brigade (4-10) in the first round of the playoffs next Saturday at 4 p.m.
"I'm happy we ended the regular season with a win," said Soul coach Clint Dolezel. "We thank our fans for all of the support this season and look forward to the playoffs next weekend."